The third book in the New Testament beginning with Luke 1:3 KJV, Dr. Luke is writing an account of the life of Jesus for Theophilus and gives him a title of “most excellent”. Luke begins with a description of Zacharias and his wife, Elizabeth. Zacharias was an old priest with a long white beard and his wife was a wrinkled, old, white-haired lady. They came to the temple every year for Zacharias to perform his duties and they prayed for a child. It was a sad time in a Jewish home if they did not have children. They felt like God was not pleased with them. But Luke explains that the opposite was true. They were both righteous. Not just good, but “righteous”, right with God. They lived obeying the 10 Commandments. God was very pleased with the way they were living. We live by faith though God’s grace, or by salvation. They came to the temple one year for Zacharias to carry out his priestly duties. It was his lot or time to burn incense when he went into the temple. The entire multitude was praying outside at this time. Suddenly there appeared an angel at the right hand side of the altar where the incense was being presented. (Incense was something like sweet smelling herbs, cinnamon, etc., a mixture that would smell good.) The whole time it made smoke while the people were praying. The people waited for Zacharias to come out, but he didn’t. They waited, and waited, and said maybe he saw an angel or something. When Zacharias saw the angel, fear fell upon him. (That’s enough to make one afraid!) But the angel put him at ease and said “fear not for God has heard your prayer and you and your wife will have a son. You shall call his name John and many people shall rejoice at his birth. He shall drink neither wine nor strong drink and be filled with the Holy Ghost from his mother’s womb. He said other good things about him, but Zacharias didn’t believe him. We are too old to have children. But the angel said, “Because you don’t believe what God said, you will be unable to speak until the child is born. The people outside wondered what was going on with Zacharias at the altar. After a long time, he came out but had to use sign language. He was unable to talk. It was in the 6th month of her pregnancy that the Lord sent the same angel Gabriel, to a virgin girl in Nazareth with the same message, “You are going to have a son.” He appeared to her and said, “Greetings, Mary, you have found favor with God.” Like Zachariah, she was very afraid when she saw the angel, but unlike him, she was not unbelieving. She just wondered how it would happen because she had not been with a man and had no husband. The angel told her that it would be the work of the Holy Spirit. God would be the father and she had been chosen to be the mother. She did not argue with the angel about God’s choice, but gave him assurance that she would accept God’s will for her. I have heard it said that mothers, when reading the scriptures back then, would mention that some young girl would be chosen to be the mother of Jesus. What would you do if it was you? Surely she must have heard about it from somewhere. In that day and age, it was Jewish tradition for parents to pick out the husband for their daughters. They went through a year’s engagement (espoused) before they were married. During this year they did not see one another. This was a legal matter and the engagement or espousal could only be broken by legal means. The wedding was a large social event held with all the friends and family. Mary was espoused to Joseph when he found out about her pregnancy. He decided to divorce her from the espousal, but do it in a quiet manner. The Lord spoke to him in a dream and told him to go ahead and marry Mary. God had other plans for Joseph. John was a strange man, but he lived a life to please God and do the will of God. I parked in front of the grocery store and noticed a man sitting in a lawn chair for sale on the sidewalk. His back was humped over, his head bent down and beside him was an empty Coke bottle and empty pack of crackers. It was a scene for a Norman Rockwell painting of “Forsaken.” A voice inside me spoke clearly, “pray for this man.” Lord, I thought, I can’t do that! But the Holy Spirit insisted, so I got out of the car, walked past the entrance to the store and intended to pray for the man, but my feet carried me on past him down the sidewalk to the end of the store. “This won’t work,” I said to myself. “Lord, I have to have Your courage!” So I turned around, walked back and stopped in front of him. “Are you not feeling well?” I asked. “No,” he replied. “Would you like for me to pray for you?” I asked. He slowly raised his face and two blood-shot eyes looked into mine. “Yes,” he replied. “Lord, he’s drunk,” I thought. “That’s ok” the voice said. I felt the need to touch him, so I reached down to pat him on the knee. Quickly, like a drowning man reaching for a life preserver, he reached out and clasped my hand. I was startled I didn’t know what to say or do. “I hope you will be feeling better,” I told the man and walked into the grocery store. I picked out a cart from the rack and started down the aisle. Then I heard it---the most beautiful orchestra music---coming from my heart. (That’s the only way I can describe it.) I began walking---no, I floated down the aisle pushing my cart. After a few minutes, the music discontinued, and I was able to buy groceries. The Lord hasn’t sent me any more beautiful music but He does ask me to pass His request to people, and some of them are unusual. Yours is that I hope you will find time to pray for Tilly Swamp Church, that we will acknowledge our sins and be bold witnesses for Him in our neighborhood. I have written a song about this. Perhaps I can get a copy of it for you and your family. Everyone was excited after the banquet ended the weekend writer’s conference at Anderson College in June 1986. Leaving that night was not part of my plans, but before I knew it, my suitcase was packed and I was on my way to Irwin’s, my son’s house, to spend the night. My mind was in a whirl thinking of new ideas and I was unaware that the bright evening sunlight had turned into dusk darkness. Nothing looked familiar. Pulling into a driveway I tried to check my map but only a jumble of roads were visible. The best decision would be to ask someone for directions, so when I saw a roadside diner I pulled in and rushed inside. Two men near the door were seated at a table talking. I interrupted them, “Could you tell me the way to Clinton?” One man said, “Take that road. In 10 minutes you will be at the interstate. Drive the speed limit, watch for exit signs and you will be there in one hour.” I returned to the car with my heart beating like a racehorse. Following his instructions I was soon on the interstate and thinking that I better not miss the exit signs, while praying in the Spirit “Lord, help me.” Mile after mile, minute after minute, ticked away then the thought occurred to me that if I would exit the interstate at Laurens (a small town near Clinton) I would not have to backtrack 2 miles to Clinton. So that was my decision. When the Laurens exit came up, I drove into the town, but in my eagerness to get to Clinton, I drove left on the first road I saw. After a few minutes my mistake was apparent, so I turned around and drove back to main road “A” and stopped at a gas station for directions to Clinton. The man said “take this same road “A” and drive to an intersection with a large store sign, Sky City, turn left and the road goes straight to Clinton. My heart started pounding and fear followed me like a lion roaring at my back. It froze my mind and I could not remember the name of the store where I was to turn. I drove further and turned left, ending up in a residential section, then back to road “A”. Looking up ahead, I spotted a fork in the road. It was impossible for me to tell which was the main road, so I decided to take the one to the left. I was in the intersection of the two roads when I realized my mistake and decided in an instant to make a U turn and get back on road “A” failing to notice the wet surface everywhere from a recent rain shower. While making the turn, the car decided to take a mind of its own when the front wheels left the pavement and slid on the wet red clay shoulder of the road, going down a short incline. It ended up with the left front fender resting gently on the back of the ditch bank. My heart pounded as my chest tightened around it. The roaring lion had caught up with me! “Oh Lord, help me, help me, help me!” I pleaded and checked my watch. It was 10:30pm and I was alone in a strange town. Looking back over my shoulder, I saw a women with two small children in a car driving towards me. She saw my predicament, stopped and said “Come get in and I will take you back to the station where you can get help.” I eagerly followed her advice. She had only driven about 100 yards before we saw three men walking on the wet shoulder of the road toward us. They were dressed identical and looked identical. They wore black clothes, a long black rain coat, black pants, and a black hat with the brim pulled down. I couldn’t see their features under the brim although the night sky was filled with moonlight and stars along with the glow from city lights. They were walking briskly and talking fast so I couldn’t understand their mumble. So the woman said, “Would you help this person? She’s in the ditch.” One of them said “alright” then she turned around again and headed back the short distance and stopped the car. I stepped out and she drove away. I was left there alone with these three men. Every one of them looked identical. They had broad shoulders and big thick chests. They look like they were body builders or something of that nature. All three of them were the same height and wore the same black clothes. It looked rather strange but there was nothing left for me to do but to trust them. They told me to get into the car and start the motor, so I did. I had noticed that when I got in and out that the front wheels were on the ground and the back wheels were up off the pavement. It was not level with the road. One of them said, “When I yell, you press on the accelerator and turn left.” I followed his instructions and with one big push the car was out of the ditch and back where it was supposed to be. The wheels caught the pavement and it turned around gently. I began to drive off, but first I glanced back and said “God bless you, thank you!” I made that sharp turn to the right and after that turn, there was Sky City, the word that continued to escape my memory like water in a bucket with a hole in it. The area was lit up like a real sky city. I turned left and was finally on my way to Clinton. The entire episode of in and out of the ditch lasted ten minutes. I was there in 20 minutes. I looked at my watch as I drove into Irwin’s yard and it was 11:00pm. His bedtime was 11 o’clock. I parked in the yard and went into the house since the light was on. He was sitting on the floor working on a large piece of furniture with shelves on which to place his TV. (He likes to build things.) He was busy so I told him that I had decided not to spend the night at Anderson College but come on tonight. I quickly went in the kitchen and found paper towels to wet and wipe the red clay off the car’s front fender so he wouldn’t see it and ask questions. We went to bed and the next morning I slept leisurely until time to get up. When I walked into the living room Irwin was working on his furniture again. I said, “Well I guess I better get back home to Dad.” So I gave him a hug and left. It was an uneventful 90 minute drive to Columbia. On the outskirts of the city I noticed a large, tall building and remembered that Fred’s brother was in the hospital here and he might like a visit. It was not very far from the main road home, so I drove over there and went in for several minutes. He was merely in to have some tests made. When I left and was going back through the lobby I met his wife and 2 children who were coming to see him. She looked at me in complete surprise. “What are you doing here?” she asked. She hadn’t expected to see me. “I spent the night with Irwin,” I told her “after attending a weekend writer’s conference at Anderson College.” The strange thing is my memory of this entire incident ends here. I don’t recall the two-hour drive home from the hospital or anything after I told Loreese goodbye. I have written this true story because I think God would like for me to share it. My events remind me of the three men in Abraham and Sarah’s story and their miracle. Read it for yourself and discover why the Bible is the same yesterday, today and forever. God’s promises are true. His Word is true. For the first 19 years of my life (1931-1950) Piney Grove Baptist Church was my church home and helped me to become the person who loves Jesus that I am today. Going to church was the high point of my week. The members of this church came from a farming community. When I was 37 years old I felt something was missing in my life. I didn't know that at the time I accepted Jesus as my Savior, I should accept Him as the Lord of my life. John 10:10 says "I am come that they might have life, and that they might have it more abundantly." That's what I was looking for--the abundant life! 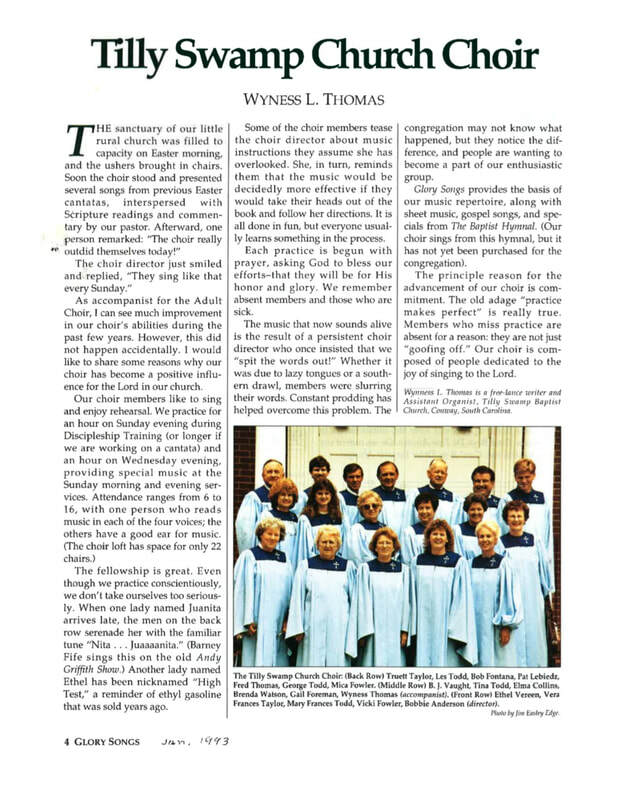 During that time I was organist in the Methodist Church at Myrtle Beach. I met a group of people who were excited about Jesus and had a joy in their life. They acted as though Jesus was their very best friend. They coaxed me to join their group and taught me about the Holy Spirit; how He lives in me and is my teacher and guide, how to listen for His voice and ignore the lies of Satan. ​ One day while we were praying, a warm blanket seemed to cover me from my head to my feet. I felt strangely happy. The next day I could not wait for Fred to go to work so I could shout with joy and read my Bible. Someone told me that I had been born again of the Spirit. It did indeed feel like I had touched a starter button. The sky seemed bluer, the grass greener, and when I read my Bible, certain words jumped out to me as though God was talking especially to me. God created us in His image--body (flesh and blood) soul (mind, emotions and will) and spirit, that unseen part of us that lives on after we die. I began to relate to Jesus in the little incidences of every day and there was joy, joy, joy. The love of God filled my heart. The Holy Spirit and Jesus as Lord of my life was the missing link.